his top class performances show he was no ephemeral journeyman in the sport of endurance running. In the top flight on the road, country and track Marty was first and foremost a loyal clubman turning out in the Pembroke colours both at home and abroad. My first recollection of Marty was of him running the fastest leg at the Wallasey Road Relays back in the early 1980s. I remember wondering who was this new whizz-kid Pembroke had found. For the next 15 years Marty was to be one of the big names of distance running in the country. It is worth noting that Marty won medals at every level on the country from County & District to a World team silver medal in Warsaw in 1987 when England finished second team. Road running was extremely popular and very competitive during the 1980s & 90s and Marty was racing regularly at both home and abroad. 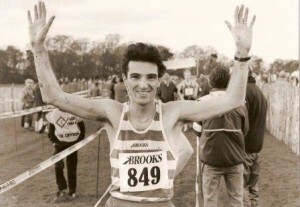 Marty ran the second fastest time in the world for 10 miles in 1987 with the excellent time of 46.26. In 1988 he won the Belfast half marathon in a new Irish all comers record of 62.57, in that same year he was 4th in the Great North Run. 1993 Britain won the bronze medals at the World Cup Marathon in San Sebastian, Spain Marty was a member of that team. In 94 & 95 Marty was the first Britain to finish in the world Half Marathon Championships. Also in 1994 he voted British road Racer of the year by Athletics Weekly as well as winning the BAF 10k championship. On the track Marty was ranked in the top 10 for 10,000 for ten consecutive years 1985 to 1995. At the Olympic trial of 1988 he finished 5th narrowly missing out on selection. Marty is still to be seen turning out at local events and is a keen supporter of his club. How long will his club records stand?